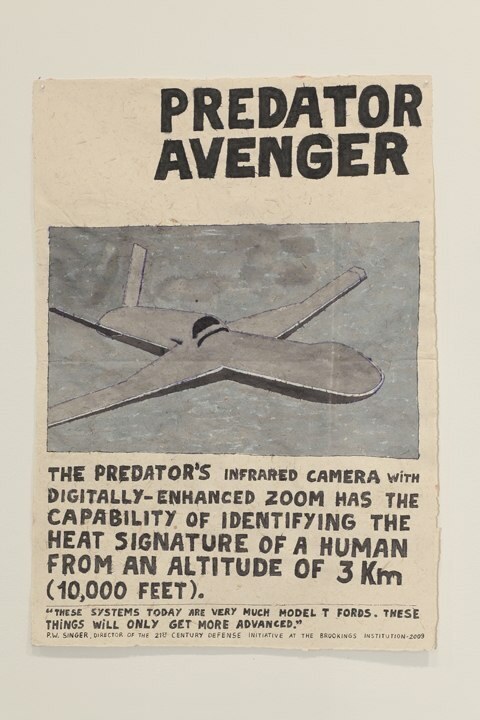 I thought the paper Rigo used for his new unmanned aircraft ink drawings was unusual, but I was too involved with the power of the text and imagery to pursue that tip. As always, Rigo’s work in the current show at Gallery Paule Anglim is timely, relevant, and important in that it addresses issues avoided by the mainstream in a manner that is accessible while managing to be fresh. Through May 1, 2010. Artforum’s current San Francisco Critic’s Picks hit the sweet spot with four strong entries. Glen Helfand’s writing on Libby Black at Marx and Zavaterro touches on the shift in Black’s work with her recent move to Berkeley that reflects the neighborhood, and further personal exploration in her work. His piece on the last show at Jack Hanley Gallery fittingly focuses on Hanley’s important contribution to the art world, both here and internationally, with a special focus on Bay Area artists. Helfand’s choice of Ewan Gibbs at SFMOMA is also well placed, as he deconstructs the mysterious drawings played out with our standard tourist locales. 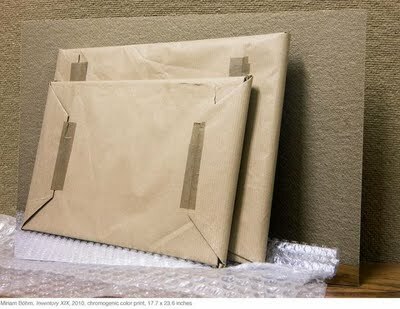 Finally, Franklin Melendez writes about Miriam Böhm’s photography at Ratio 3, a lovely show of works that he says "evoke the doldrums of office cubicles…" and are "like Dutch still lifes reimagined in a UPS store." Böhm’s show at Ratio 3 ends April 24. When he met David Lynch after a screening of Eraserhead (in anticipation of producing The Elephant Man), Mel Brooks was shocked to come face to face with the then baby-faced efant terrible. He recalled “I could swear I was going meet some stooped over Bavarian coot with Borsch dribbling from his mouth.” You might expect the same after watching the fiercely misanthropic minimalist animation of Don Hertzfeldt but you’d encounter not only the youngest maker to be given the San Francisco International Film Festival’s Persistence of Vision Award, but an artist whose work has been in commercial distribution since he was he was in film school at the University of California, Santa Barbara. Real pencil drawings (not the pseudo-“squiggle vision” that you see applied as an after effect in many cartoons) distinguish Hertzfeldt from what is likely the last generation of animators to bother to take pencil to paper. The Academy Award nominated short filmmaker uses a cast of characters of near stick figures with a Charles Addams/Edward Gory inspired morbidity, peppered with visual non-sequiturs and screeching, nonsensical dialog to create sucker punch, hit and run one-liners that have been shown all over American cable, International film festivals and beyond. His onstage interview and screening of his new absurdist film Life, Death and Very Large Utensils will take place at 7:30 pm, Friday, April 23 at the Sundance Kabuki Cinemas. After having read Calvin Tompkins’s article in the March 29 New Yorker on Julie Mehretu’s recent commission for Goldman Sachs in NYC, I was gratified to see two posts on SFMOMA’s Open Space that responded to several things that occurred to me while reading it that were completely elided in the piece. Interestingly, Anne Walsh’s post began as a comment to the Rebar post, and takes the conversation further while describing her mixed feelings.